and Flags #2 quilt top was finished yesterday. Both tops measure 61″ square. Use all the flag blocks as is with no ripping out or resewing. Done even though several of the blocks were extremely lopsided. Use stash fabric. All the fabric came from the stash I inherited from my Mom. 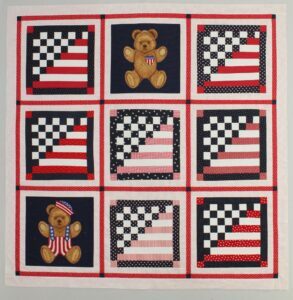 Incorporate the panel of patriotic bears. I think that they add an extra unexpected touch to the quilts. 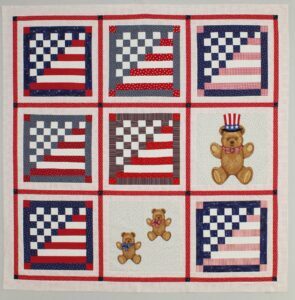 Use the spools of red, white and blue thread for machine quilting. I machine quilted Flags #1 this weekend. When I was finished there was 12″ of the variegated thread left on the spool. It is a good thing that I have another spool of red, white & blue to use for Flags #2. The binding is almost completed for Flags #1 and the backing has been located and washed for Flags #2. I have made some decisions regarding the Lincoln quilt, but I need to stay focused for a day or two more to finish up the Flag quilts. Isn’t it a great feeling to have a completed quilt? You done good! Love the bears and love the self-imposed rules.